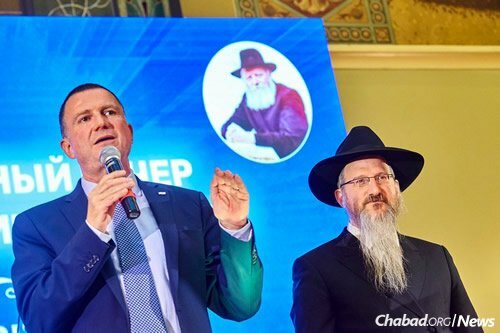 When Yuli Edelstein was arrested in Moscow on Sept. 4, 1984, the KGB searched his family’s apartment, discovering Hebrew books and a small container holding what they claimed were drugs. 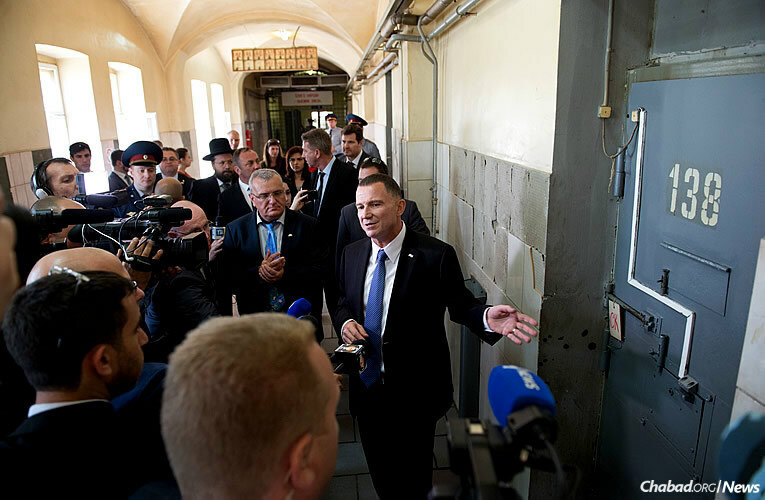 Taken to an area police station for processing, Edelstein, today the Speaker of the Knesset in Israel, was followed there by his late wife, Tanya. “Give him food!” he heard her shouting at police from his holding cell. “Give him his prayer items!” Her cries were ignored. At his first interrogation that same day, Edelstein was presented with formal drug charges and asked to sign the indictment, written in Russian. The 26-year-old Moscow Hebrew teacher refused, asserting that according to Soviet law, he had the right to choose the language he wanted to be interrogated in, and he chose Hebrew. Under pressure from superiors to move the process along, the militsiya officer (militsiya being the rough Soviet equivalent of police) became agitated, trying to convince Edelstein to agree to be processed in Russian, the language familiar to the officer. “The truth is I’m not even allowed to talk to you right now. According to Jewish law, I need to pray before I can speak,” Edelstein responded, deploying a bargaining chip he knew was not technically true according to halachah. “So there’s my office, go pray!” the officer cried out. Edelstein explained that he needed his prayer items, his tefillin. Seeing the black boxes and leather straps, the Soviet policeman said he would allow the boxes, minus the straps, which, like shoelaces or belts, were strictly forbidden in prison. 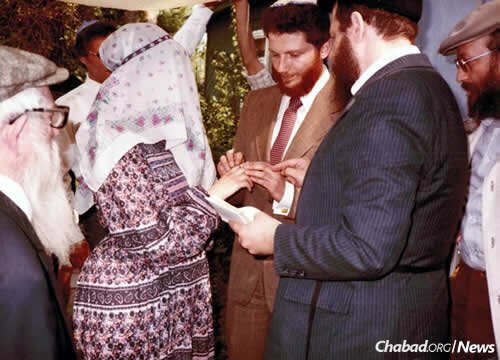 Informed of the development, but not knowing whether she was allowed to separate the straps and the boxes, Tanya Edelstein ran to the old men known in Moscow as the Chabadniki: Reb Mottel Lifshitz and Reb Getche Vilensky, two elderly Chabad-Lubavitch Chassidim who prayed in the small hall of Moscow’s Choral Synagogue and around whom circles of young Jewish dissidents had formed. “You have the chance to give him tefillin?” they asked her. Finally, in possession of his siddur (prayerbook) and tefillin, Edelstein denied the drug charges—in Russian—and proceeded to pray each morning with his hard-earned religious items, placing the tefillin of the head under his cap and flexing his muscles to keep the arm one in place. For three months, Edelstein was allowed to pray. Reb Mottel and Reb Getche “realized . . . what a mitzvah means to a Jew, and what [an individual’s] mitzvah means to the Jewish people,” Edelstein later recalled. 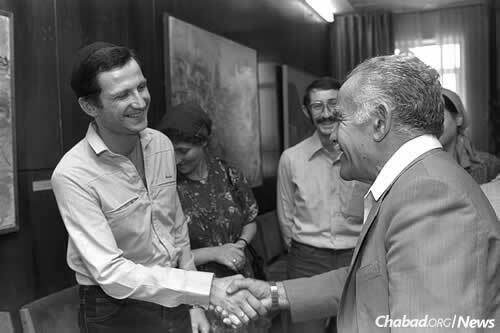 Sentenced to three years of hard labor in the Soviet Union’s system of Gulag prison camps, Edelstein sustained hunger strikes and suffered numerous injuries before being released in 1987, immigrating to Israel shortly thereafter. 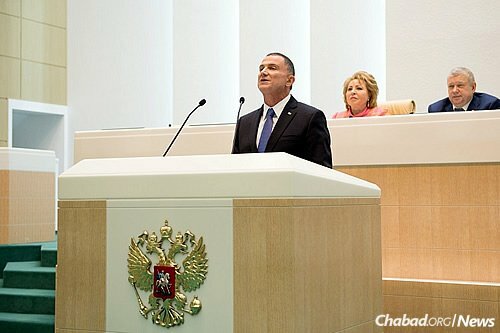 At the end of June this year, Edelstein arrived in Moscow for a historic visit on an official invitation from Valentina Matviyenko, chairwoman of Russia’s Federation Council, the upper chamber of the country’s parliament. 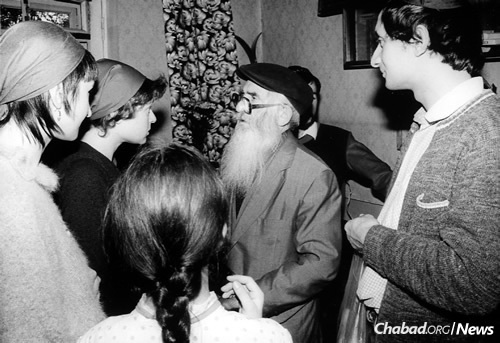 Edelstein, arrested 33 years earlier for teaching Hebrew to circles of young Jews, was the first person in Russian history to formally address the chamber in Hebrew. During his trip, he visited the apartment from which he was arrested; the synagogue where he prayed and studied; his cell at the infamous Butyrka Prison in Moscow; and members of the local Jewish community. 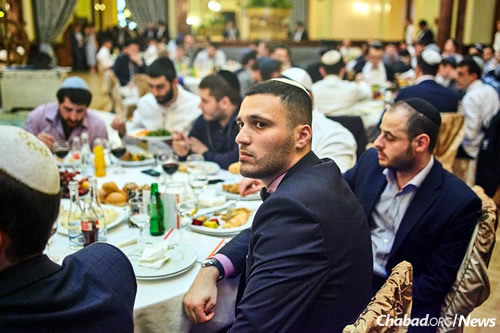 Addressing hundreds of Moscow Jews gathered at simultaneous events—one for 600 participants in Chabad’s YACHAD youth program, and another for 200 rabbis and lay leaders—held at the ritzy Hotel Metropol in honor of Gimmel Tammuz, the third day of the Jewish month of Tammuz and the yahrtzeit, or anniversary of passing, of the Rebbe—Rabbi Menachem M. Schneerson, of righteous memory—Edelstein placed a spotlight on the Jewish heroes of the Soviet past. He meant that same Reb Mottel, known as der Shoichet (the ritual slaughterer), Reb Getche and Moscow’s other diminutive old Chassidim. “They changed my understanding of what a real hero is. This is something I’ll never forget because like any Jewish boy who grew up in the then-Soviet Union, I, of course, wanted to be the strongest hero; that was the ideal. I trained in boxing, karate. I wanted very much to be like [Arnold] Schwarzenegger . . . because that’s a real hero. The columned portico and dome of Moscow’s Choral Synagogue overwhelms a slanting side lane in the city center. Between 1960 and 1994, the street was named Arkhipova; many still refer to the synagogue by its old street name. Closed by authorities for a brief period in 1930, it reopened a few months later following the disbandment of the Communist Party’s Jewish section, the Yevsektzia, and has remained open since. The Choral Synagogue was one of two Moscow synagogues that survived communism—the other being the Lubavitcher shul in Marina Roscha, built in 1927 and destroyed by arsonists in the 1990s, and today the site of the Federation of Jewish Communities’ central Moscow Jewish Community Center. It was the officially sanctioned home of Judaism in Russia, a showpiece the regime used to try and impress foreigners with their tolerance. 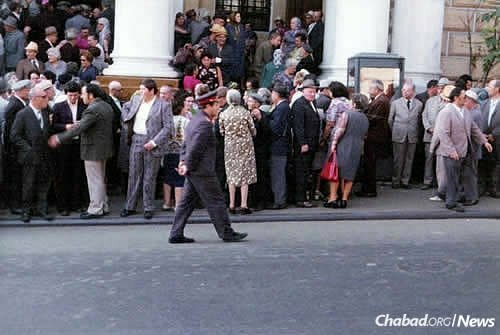 Filled with old people—whom the Soviets saw as tolerable relics of the past as long as they didn’t pass on their knowledge and faith to the next generation—the synagogue was also infiltrated by informers, whose ubiquitous presence kept curious young Jews far away. 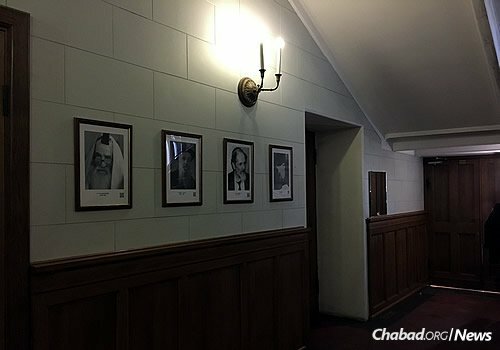 Walk through the main synagogue entrance these days and a series of framed photos bearing the likenesses of the old Chassidim—Reb Mottel, Reb Getche, as well as Reb Avrom Meller and Reb Shimon Trebnik—lead to what was known as the Chabadnitza, the small synagogue just off of the gold-leafed main sanctuary. For these men, the small synagogue was their home, their base—the place they taught younger generations of Soviet Jews not just by the book but by example, the visage of faithful Jews who continued to live as such despite crushing obstacles. Nobel Prize laureate Elie Wiesel had encountered some of these men in the fall of 1965, when he took the trip that would form the basis of his report on Soviet Jewry, the groundbreaking Jews of Silence. 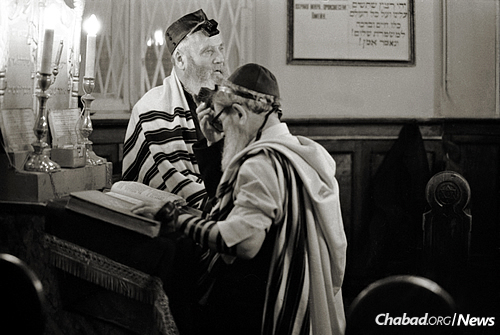 On Simchat Torah, Wiesel danced in the big hall and on the street together with thousands of other Jews, but one night earlier, on Shemini Atzeret, he had joined the Chassidim. Witnessing the passionate tears and joy of these vestiges of Chassidic life, Wiesel wondered how it was possible. 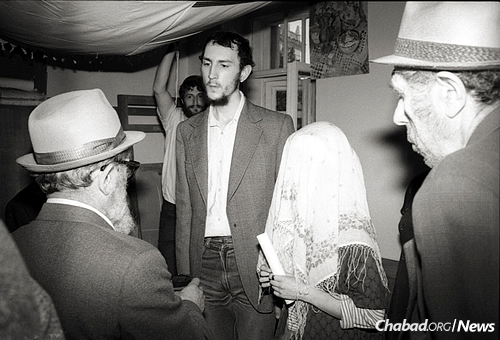 Beginning in full force in the 1970s, young Jews wishing to reconnect to the heritage denied to them for half a century by a brutal regime began applying for exit visas. Once denied, they became classified as otkazniks, or refuseniks, left in a quasi-legal limbo that saw them expelled from university, let go from their jobs and socially ostracized, sometimes even from their own families. Following her father Zeev Dashevky’s resurgent interest in Jewish matters, Ira first went to Arkhipova as a teenager on big holidays—Yom Kippur, Simchat Torah and the like—with Michael soon joining them. At first, they didn’t even enter the sanctuary, sufficing with singing “Hava Nagilah” and popular Hebrew songs on the street outside, scenes similar to the one described by Wiesel. Attempting to intimidate them, the KGB illuminated the street with floodlights and snapped pictures of the young people congregating outside. That feeling of solidarity with other young Jews, and an interest in Zionism and the Hebrew language, led them there. But when the Kara-Ivanovs and their young friends—soon to include Yuli and Tanya Edelstein—began exploring Torah study and religion, they ran into a problem: They had no books, and there was almost no one around who could instruct them. One teacher was Reb Avrom Meller. 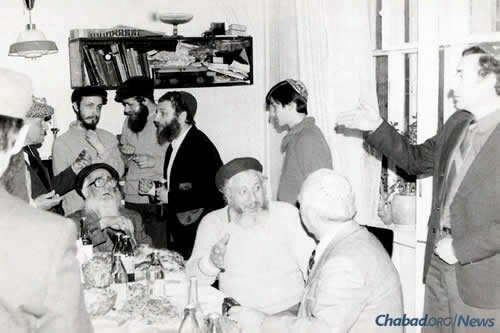 Having at one point studied at the yeshivah of Rabbi Yisrael Meir Kagan, known as the Chofetz Chaim, Meller did not come from Chabad roots but grew close to the Chassidim in the small hall to the point of becoming one of them. The KGB warned him to stop teaching in Russian—the language young people understood—but he refused, and subsequently lost the stipend he relied upon for his impoverished life in the Soviet Union. 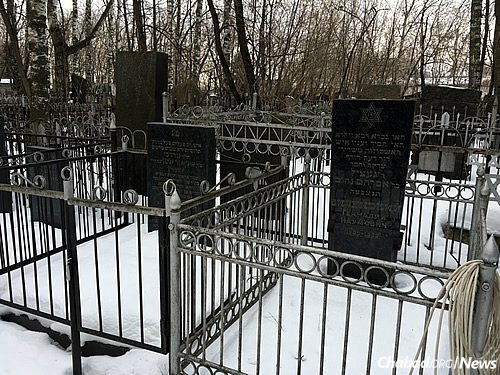 Unafraid, he would wryly comment that due to his age, he knew the Soviets couldn’t exile him further than the Moscow suburb of Malakhovka (in other words, the town’s Jewish cemetery). Varied groups of loosely interconnected refuseniks popped up, roughly splitting into two categories: Hebrew-study groups and Jewish-study groups. The Kara-Ivanovs were mostly in the Jewish-studies group, while Edelstein was a Hebrew teacher. 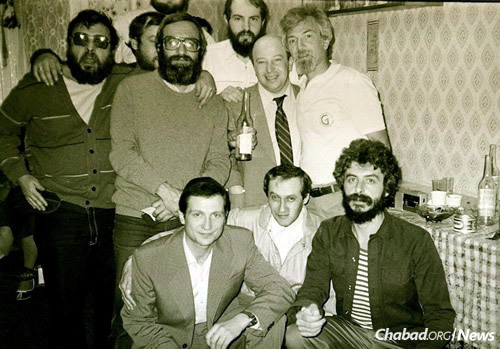 The early 1980s were dangerous times for Jewish activists in the Soviet Union; many refuseniks were reading materials on how to handle KGB searches, interrogations and arrest. Still, Edelstein’s arrest came as a shock. Another Moscow Hebrew teacher, Alexander Kholmiansky, was arrested at the same time, the KGB planting a gun in his apartment. What forever impressed Edelstein was not that Reb Getche didn’t pocket the funds; after all, “lots of good Jews don’t steal.” What stuck with him was that in the poverty, anger and utter desperation of Soviet life, nobody even thought to accuse the venerable Reb Getche of misappropriating the funds he alone administered—a true feat for the time and place. 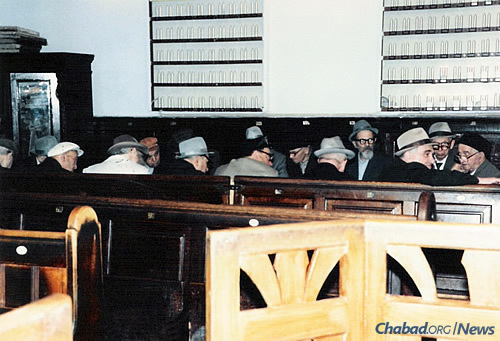 Reb Mottel might have been known as the shochet, but he was also the mohel, and more often than not, the chazzan in synagogue. For the Kara-Ivanovs, who applied for exit visas as a young married couple and finally received them as a family with four children, the old men were their links to life-cycle events. 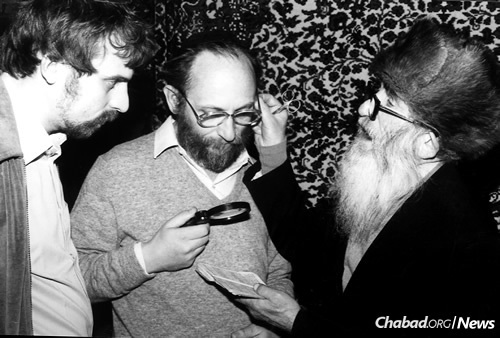 The men conducted their chuppah ceremony in their tiny apartment (as they did for the Edelsteins), and Reb Mottel circumcised their sons, with Reb Getche serving as sandek for their eldest. And while Reb Mottel was legally employed as the Moscow Choral Synagogue’s official mohel, that did not mean there was no danger involved, neither for him—Reb Mottel had already served seven years in Stalinist labor camps in the Kolyma region in the 1930s and ‘40s and did not wish for more—nor for the young parents choosing to call him. 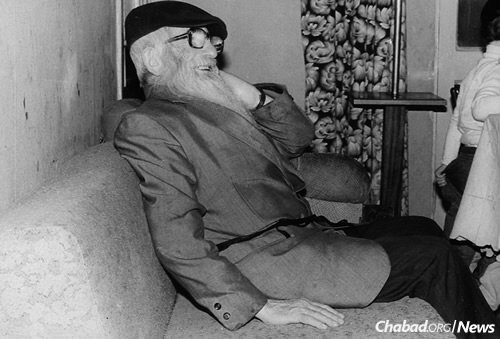 Speaking in Moscow at the event for the Rebbe’s yahrtzeit, Edelstein recalled one particular story. It was 1979 or 1980, and a baby boy was born to a family of Jewish dissidents. 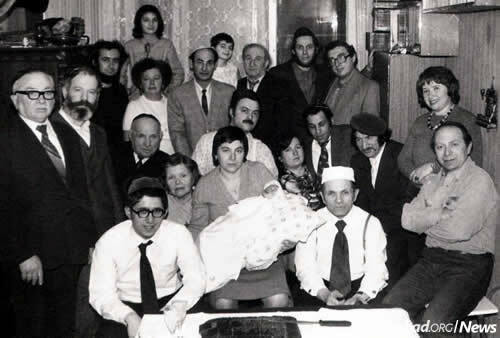 The mohel was called, and on the eighth day, a few dozen people gathered at a Moscow apartment to welcome the Jewish boy into the covenant of Abraham. The militsiya officers soon left, warning everyone to clear out. The people in the apartment understood there would be no circumcision—not on the eighth day, not on the ninth day, maybe not at all. It was over. Half an hour later, there was another knock on the door, and in walked Reb Mottel, his face a ghostly white. Edelstein choked up, pausing for a drink of water. 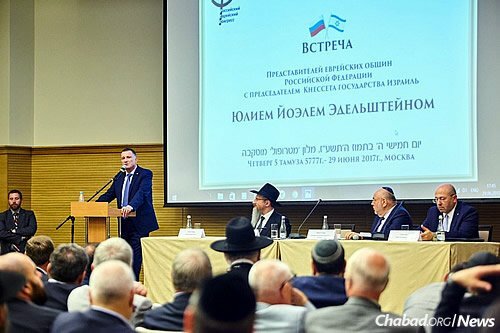 Edelstein’s visit in his official state capacity has been widely hailed as a potent symbol of the victory of the Jewish spark, but for young Jews in Moscow—most of whom cannot fathom the circumstances of Jewish life a mere few decades ago—Edelstein’s emotional speech opened a new window on life in those years. 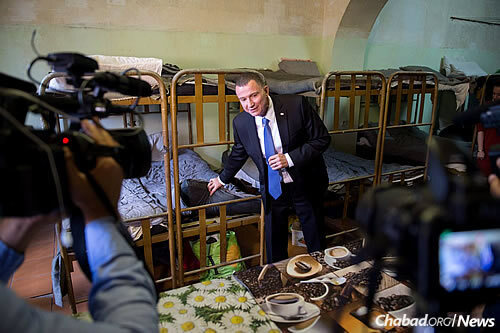 After his conviction on drug charges, Edelstein was returned to the Butyrka prison. Although he attempted to hide them, his tefillin were discovered and this time taken away. Standing in a hallway outside his cell, Edelstein watched a guard take the black boxes and break them against his knee. The even-keeled Edelstein lost himself and pounced on the guard, being quickly pulled off by the four other guards nearby, receiving a light beating and 15 days in solitary confinement as a result.